Christmas is nearly here and with the holiday season comes the stress. We are rushing around to decorate, bake, shop, and attend holiday parties and gatherings. And this is in addition to our everyday obligations. We want our tree to be beautiful, our house decorated just so, our cookies picture perfect and tasty and we must have the right gift for that hard to buy for relative or friend or the hot toy for our children. All the while, maintaining everyday tasks such as work, cleaning the house, laundry, activities with the kids, etc. This is a lot of stress we place on ourselves. We don’t get enough sleep. We are up late trying to accomplish all these daunting tasks. We don’t eat correctly. There are a lot of holiday foods and most of us tend to overindulge. We put our exercise routine on the back burner in order to have that extra hour to accomplish all these tasks. What if our tree was not perfect? But it is perfect in its imperfection? Our cookies taste great but may not look picture perfect? And perhaps the right gift is time spent with that relative or friend? Perhaps the hot toy is not what everyone else is getting but something much simpler? Would Christmas still happen? Of course it would. Letting go of the expectations we place on ourselves could reduce a tremendous amount of stress. We could possibly relax a little and enjoy the season. I know I am guilty of placing stress on myself during the holidays. Give yourself a time-out – take a half hour everyday just to relax and clear your head. Meditation or a soak in the tub are good ways to unwind. Time spent unwinding could help give you focus to accomplish all the days tasks. Exercise – it helps to relieve stress. A short workout, such as a walk around the block or through the mall will get your blood pumping and help to relieve stress. And be sure to stretch. Stretching will get blood moving through those muscles that are stressed. Sleep – Be sure to get enough sleep. Being sleep deprived affects your overall well-being. Healthy Snacks – Be sure to choose a healthy snack in all the of holiday foods. Fruits, vegetables and nuts are sure to please. Schedule a massage – taking time for yourself to relax and unwind will give you the boost you need to finish the season strong. It is the perfect way to reset your mind. And last be sure to breathe. Sometimes just stopping and taking a deep breath will clear your head, calm your mind and help you to re-center and focus on what is important at that moment. To sum it all up, enjoy the season and all the chaos it brings. Let go of the expectations and find the beauty in what is front of you. Take care of yourself, so you can take care of everything you need to. Eat right, exercise and get enough sleep, so you have the strength to keep going. 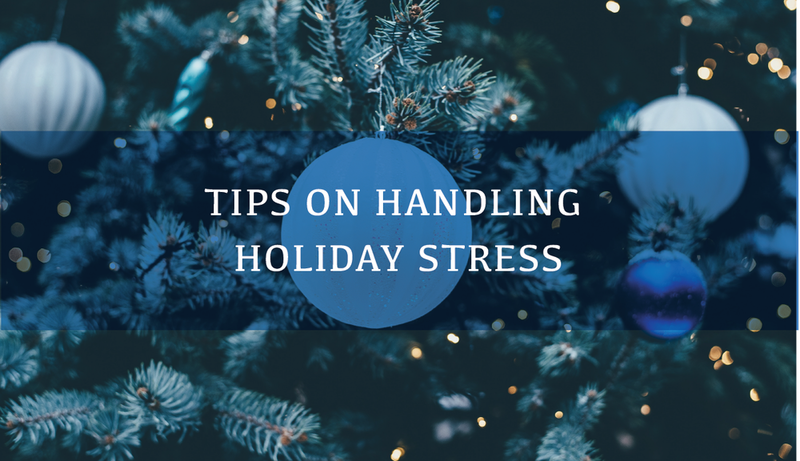 I hope these tips help you reduce your stress during the holiday season and help you have the best Christmas ever.